No one can go wrong wearing a classic plain lightweight cross pendant on a necklace. This pendant and its many variants have become a staple even as jewelry and fashion accessories and this 14 Karat yellow gold version is simply beautiful. It is simply, yet masterfully crafted with a small hole built into the top where a rounded hook is inserted for suspension on the necklace. Being plain lightweight and yellow gold ensures that it may be used on just about any necklace of similar color or different when the desire to create contrasts demands it. The dimensions are 27mm x 13mm. 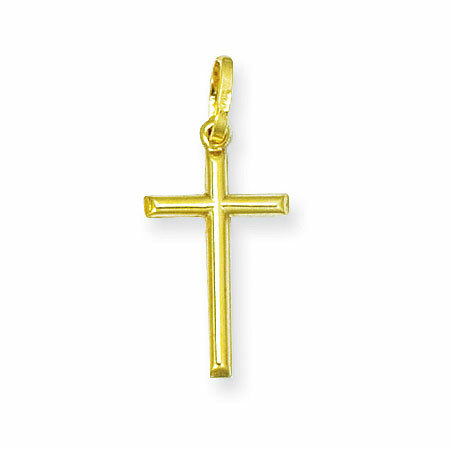 We guarantee our Plain Lightweight Cross Pendant in 14K Yellow Gold to be high quality, authentic jewelry, as described above.